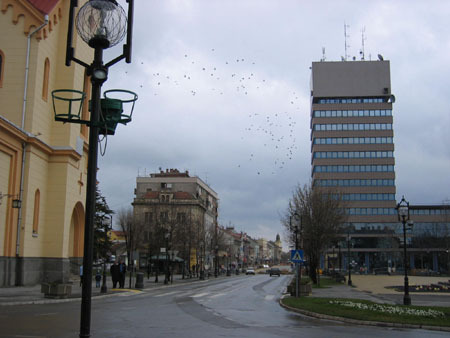 Zrenjanin is located around 30 kilometers East of Novi Sad and 80 Kilometers North of Belgrade. 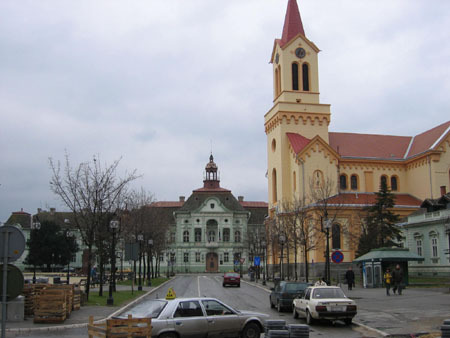 It is a town with a population of around 80.000 people. 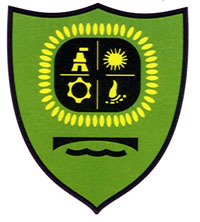 Zrenjanin is located in the Central Banat district, Vojvodina province. 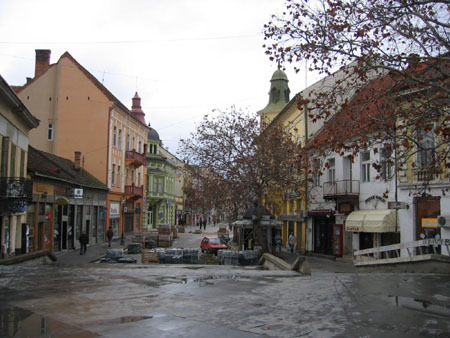 The history of this city goes back to 1326, at that time it was known as Veliki. 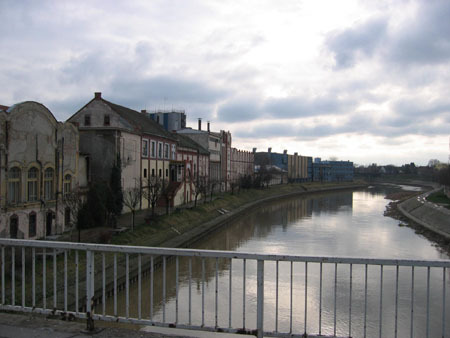 The name of the city was changed into Zrenjanin after Zarko Zrenjanin who was a leader of the Vojvodina Communists and wartime Partisans during World War II and who was killed trying to avoid recapture by the Germans in 1942. .
We visited this city on February 17, 2007. It was a little bit cold and rainy but the city certainly didn't look gray. They have a nice pedestrian zone which is almost finished, probably it will only take one or two more weeks. 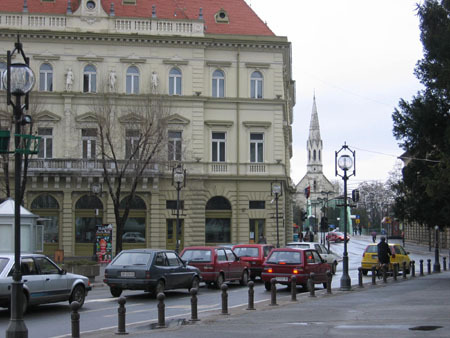 The shops are not as modern as in Belgrade but this will probably change with this new pedestrian zone. 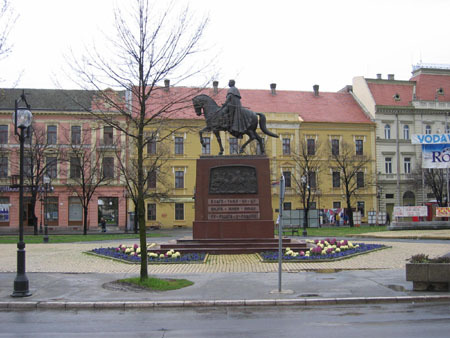 Parking is easy, there is plenty of space close to the city hall and the monument of king Peter I of Yugoslavia. Another nice view is the small bridge with the reformation church and court house on the background. Especially when the weather is a little bit warmer you can stroll around for several hours admiring the architecture. 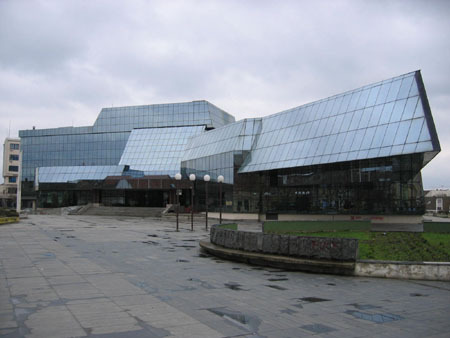 And of course modern times also touched Zrenjanin, look at this building which I think is so ugly it almost looks nice again. It also reminded us of old Yugoslav glory, completely out of place now, covered with graffity and barely used. Like in many other cities there are some 'modern' concrete fountains (out of order) in front of the building, bweuh!.